The first round of roads have closed. ATLANTA — The teams that will be playing for the Vince Lombardi Trophy in Super Bowl LIII have been decided. The Los Angeles Rams will take on the New England Patriots in the Mercedes-Benz Stadium on Feb. 3. Atlanta has been planning for more than a year and as it gets closer, residents will start to feel the effects of the big game. 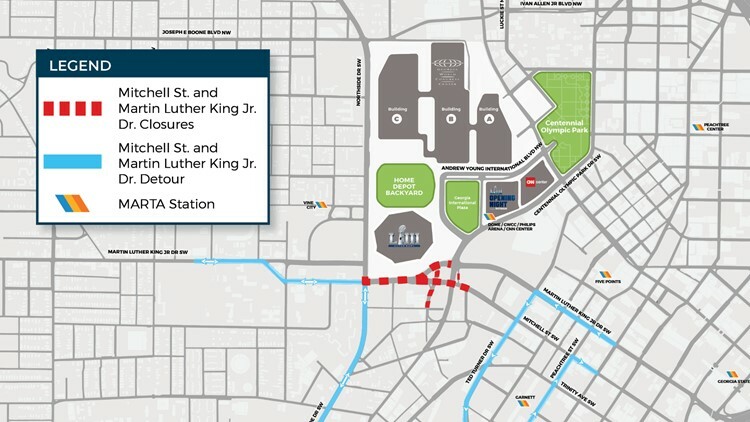 The first street closures in advance of the Super Bowl have already been put into place. Baker Street NW will be closed between Centennial Olympic Park Drive NW and Luckie Street NW. This is the stretch along the front of the World of Coca-Cola and the Georgia Aquarium that faces Centennial Olympic Park. Closures begin Jan. 21 and end Feb. 8. Other streets will close later in the week as events progress. You can find your complete guide to Atlanta's street closures right here. You can also find a full guide to everything Super Bowl-related right here.